....if you want them to have high self-esteem or learn about autism. This past week has been nothing short of amazing in the world of cognitive dissonance. At work, I was honored by being offered a key position in a critical program at one of the largest high tech companies in the world. I had worn my favorite black hoodie to my job interview. On the day I received my official offer letter, I received handshakes, congratulations, and assurance from my boss and other leaders that this is a great honor and opportunity. I rest knowing that I am amongst the top in the world at the work that I do, and brace to continue towards being even better. I am proud of this work that makes such a contribution to the world at large. This is a world where I am accepted and valued, and it is good. In the past few weeks, however, I have been taking vacation time to attend Autism related conferences in an effort to expand my knowledge of the “autism profession.” This is a world that is uncomfortable for me at best and downright hostile at worst. Don’t get me wrong. I realize that these professionals are trying to do well. I know they have good intentions. But just after my promotion, I was literally brought to tears in one of the events. This is amazing because I am so strong. 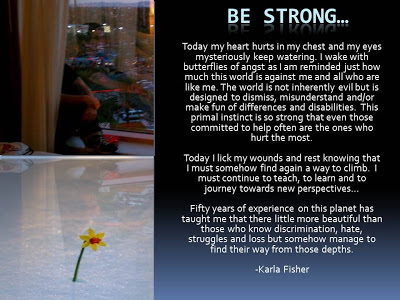 I fear today for those who are not so strong. At this latest conference, I went to a session by Tony Attwood that was particularly hurtful to me. I do not know if it was because it was the last of many, but I think that doesn’t matter. Suffice it to say that all of them had elements of this session. Attwood’s session began well, with his talking about ASD versus NT [neurotypical] as a culture. I was happy to hear this opening. I had some influence on this perspective, as I had discussed this with Attwood privately in email and through clinicians that he works with. From there, however, the cultural perspective thing sort of went downhill. Attwood was dynamic, quick, fluid, and exceedingly witty. Humor was his main way of reaching his audience and he delivered well judging by the audience, which was laughing several times each minute. He was very good overall as a speaker. The problem was that he used humor about autistic people primarily, and he spoke only to the NTs in the audience despite the fact that he knew autistic people were also there. Think about going to a conference on “Women’s Culture.” Then think that you showed up and 90% of the audience is male and the speaker is male. The speaker opens up with kind words but then spends the rest of the day discussion the limitations of women and how women feel ... from his male perspective. Think about how creepy that might feel. As he is going through this I am thinking to myself, “Yes, this is the good way to approach the information now that there is a diagnosis. Facts will help the child, and this person was seeking facts.” But my thoughts are disrupted by an audience that is in full belly laughter at Attwood’s imitation of an autistic person. My heart grew heavy as I realized that these people were supposed to understand and accept me and make my life better. If Attwood really wanted to be funny and talk about respecting cultures, he could have pulled it off if he made fun of both equally. He should not have spoken as if everyone in the audience was NT, and only explain how autistic parents might react. Alas he did not do that; most of the day was spent with me missing pieces of the discussions about NTs -- because Attwood did not explain them. When he spoke about autistics, however, he imitated how the ASD person thought. I would think “Yes, that is how I also feel” while the entire room full of parents and professionals were laughing at me. The goodness of my new position and all accolades from my coworkers and friends was completely lost in the moments that the room burst into laughter. Ironically, this also happened when Attwood made fun of the “ASD uniform” -- the one I was clearly wearing. It was the same black hoodie that I wore earlier in the week, when I was interviewed and promoted. 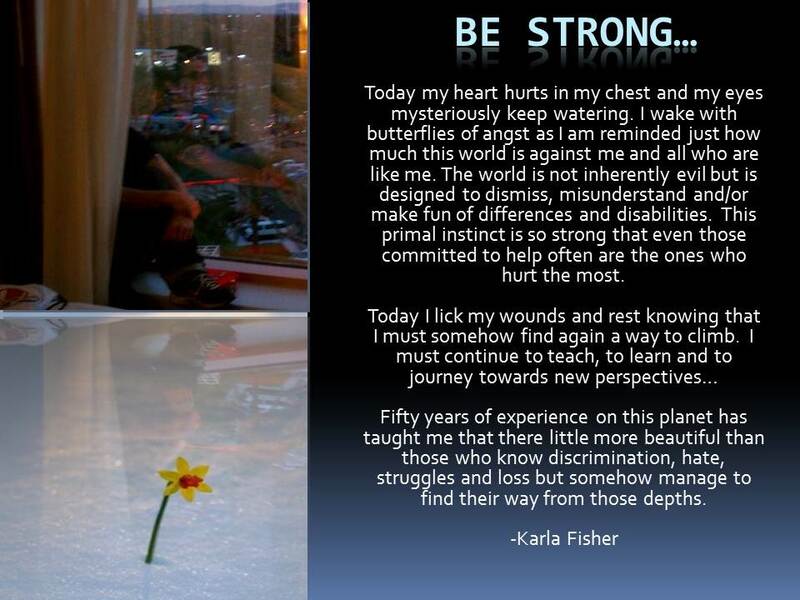 A version of this essay, and this image, were previously published on Karla's ASD page.